Even though breakfast at Tiffany’s is a special part of your stay with us, sometimes guests’ schedules just don’t allow them time for a sit down breakfast. I’ve found this recipe to be quick and easy to prepare, simple to grab and go, and it’s even helped me out in a pinch with a last minute special diet request! Cook sausage, stirring until it crumbles and is no longer pink. Drain and cool. Combine sausage, Bisquick and cheese in a large bowl. Make a well in center of mixture. Stir together soup and water; add to sausage mixture, stirring just until dry ingredients are moistened. 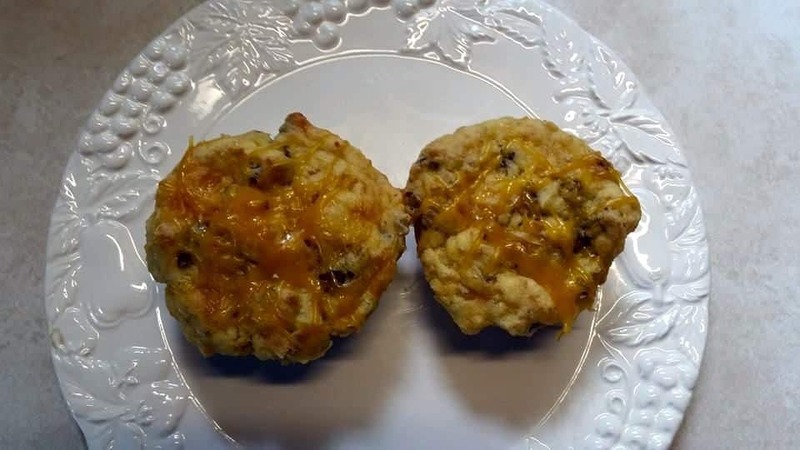 Spoon into lightly greased muffin tins, filling to top of cups. (Put water in empty muffin cups). Bake at 375 degrees F for 20-25 minutes or until lightly browned. Let set a few minutes before removing to cool on a rack. Makes 15 muffins. These also freeze nicely so you can make a batch ahead of time and grab them when you need a quick breakfast. We send our guests off with 2 muffins, a piece of fruit, and a drink in a to-go bag when they need to leave early. And if you noticed, this recipe is also “egg-less”, which is a hard food item to do without in most breakfast recipes!